Sheepdog training gives a brand new experience and fun to me, and we train with Synve whenever the opportunity comes, but in the same time I try to improve our agility skills as much as I can. I do feel that in the past couple of weeks Jet got into the next level in terms of speed, determination, concentration on agility work. What the best is , that I can see a bit similarity in her will for agility work and sheepdog work. She gets really focused and enthusiastic when she has the first glimps on the agility obstacles and knows that some training is ahead. She is very keen on working with me through those short training sessions what we do on one day. I still try to keep our trainings simple, I put emphases on speed and accuracy rather than doing very difficult combinations and sequences. I recently raised the bar to 20 cm hight, at the moment I think it is enough to practice. We have about a year more to reach the competition hight, so I don’t rush this. 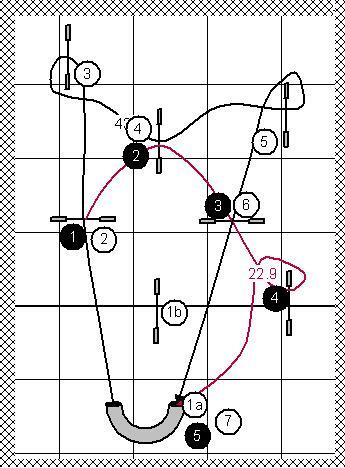 The attached course designes shows what king of combinations we practice on. Contact training goes separately, mainly on the dogwalk, see-saw was not introduced yet.